The hostel is close to D'mall. And life within the hostel is party all day til' night. I arrived at night time and instantly got drunk. The atmosphere is very welcoming. Expect to meet more Foreign than locals. 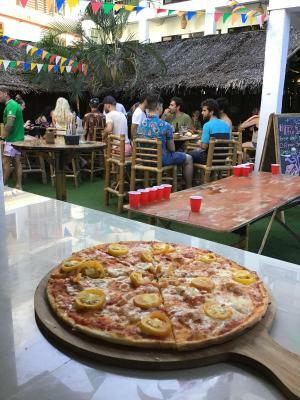 “one ring to rule them all” Mad Monkey, in general, is known for its great atmosphere, however, this MM is by far the Mothership of the entire fleet of MM hostels across Asia: This partyhostel has all of the best ingredients that one needs. Great reps, good staff, an open-to-be-used sound-system with great sound, fun games, clean dorms, a lot of fun people and above all a great, if not the best ambiance of all MM’s I’ve seen (5 so far). If you travel solo, go here. If you prefer knocking on people’s doors on Sundays to talk about Jehova, do not go here. If you want a good time, and meet cool people, go here. If you want to detox and chill, go to a library or a spa. Big shoutout the the reps, and of course my bro Robbie. Mad Monkey Boracay was the best one I ever stayed in. Comfortable, nice people, nice staff, great parties. Is just a great beautiful family, that makes everyone feel welcome and happy. I just loved!!! Excelente in every single aspect you would expect in a party hostel. Good beds, good bar, clean. Best vibe! I've never stayed in a hostel, but I decided to give this place a try since I came to Boracay to meet people and enjoy the nightlife. This place exceeded all expectations. Everyone is so friendly and just there to meet people and have a good time. Booze cruise is insane. Place is nice and staff are super friendly. Both reps Sam and Sam made sure everyone had an amazing time, the friendships made will last a life time. One of our best sellers in Boracay! 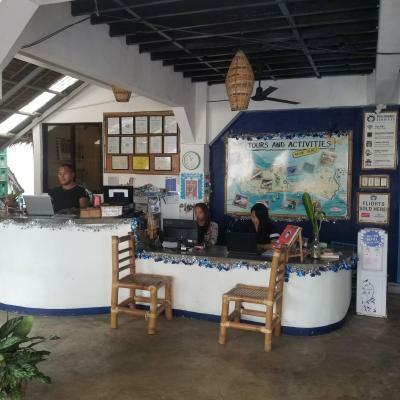 Located less than 0.6 mi from D'Mall Boracay, Mad Monkey Hostel Boracay is set in the Bulabog district of Boracay. 2.1 mi from Willy's Rock, the property is also 5 mi away from Caticlan Jetty Port. Bulabog Beach is 650 feet from the hostel. The reception at the hostel can provide tips on the area. 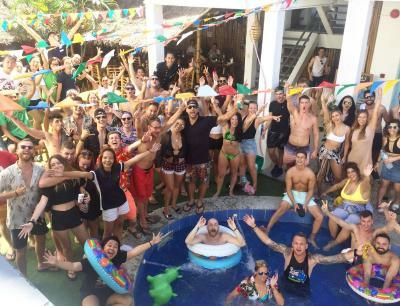 The property also features a bar that plays all-day music and party until 0100 Hrs. 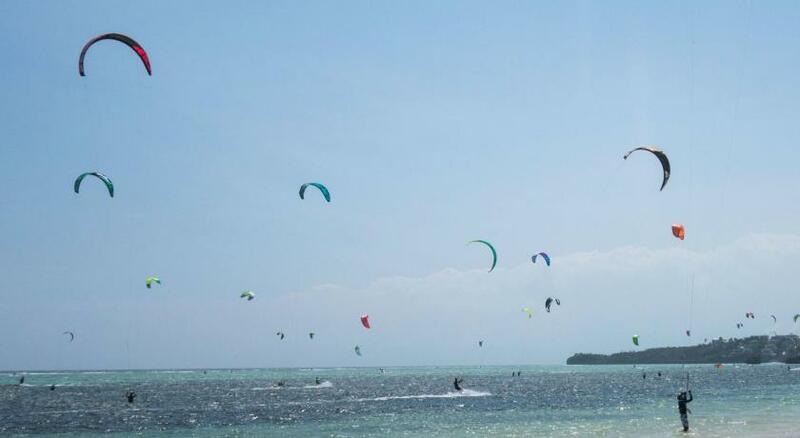 White Beach is 1,650 feet from Mad Monkey Hostel Boracay. 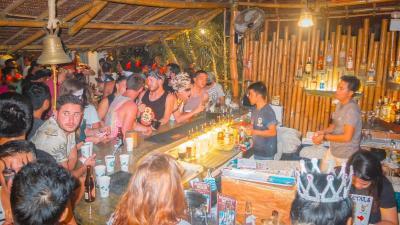 Bulabog is a great choice for travelers interested in nightlife, beaches and diving. 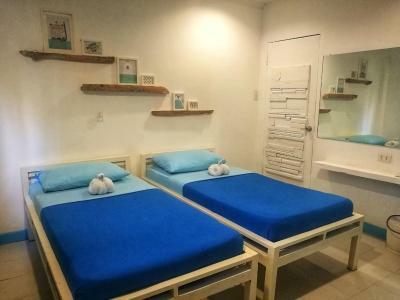 When would you like to stay at Mad Monkey Hostel Boracay? 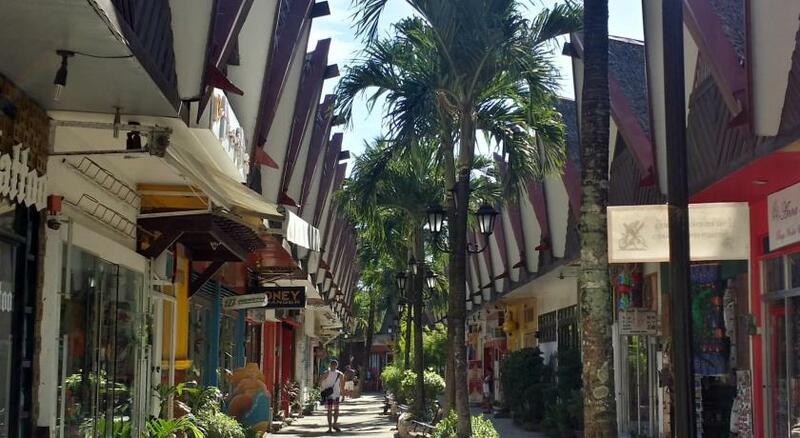 Area Info – This neighborhood is a great choice for travelers interested in nightlife, beaches and diving – Check location Good location – show map Guests loved walking around the neighborhood! House Rules Mad Monkey Hostel Boracay takes special requests – add in the next step! Great party hostel, clean, unique, the staff were great, can’t fault the place. The place is like a war zone - roads torn apart, open sewers, low hanging and broken electricity wires. Frightening spot. Showers wouldn’t drain after about 2 minutes, flooding the bathroom up to the door almost instantly. No refrain from the noise from about 8AM to 12:30AM (our room was in the worst place, by the pool and the bar). No towels available when we arrived - had to hike around looking for a towel to buy outside the hostel with little to no help from the staff. There is some construction going on outside the hostel. It didn’t affect us at all really but do expect to get dirty when walking to the main road. The rooms are spacious and the beds are much bigger than a normal single bed. They’re cleaned every morning and are kept very well. The bar, food and the pool are great. We stayed there most nights as it was a lot of fun. 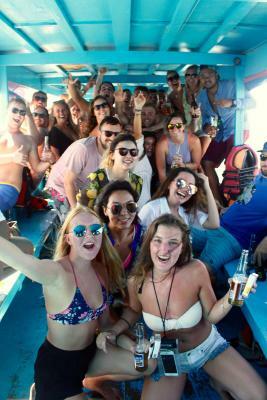 There are bar crawls and boat parties organized also. We found it really easy to book any of the activities that we wanted to do (helmet diving for example) and the guides collected us and dropped us back to the hostel which was good. The hostel is in an excellent location with everything very close by. Showers were poor, no pressure at all. Lots of construction going on around the area meaning walking to from beach was dirty and dusty. But that’s to be expected as they is construction all over the island at the moment. Very clean, could see the staff cleaning every morning and ensured throughout the day. WiFi was really good in reception but there were poor connection in higher rooms. Staff were really helpful and friendly, food was tasty. Very close to the beach just a short walk to the beach. If you like a good ol knees up then this is the place for you lots of partying and drinking going on here! Which we enjoyed! Some of us a bit too much lol. The free drinks were very diluted. I ended up getting sick here because of the amount of travellers in close proximity and a bug going round which spoiled my time at mad monkey. Sounded like an awesome time from my room though! Staff were very welcoming. 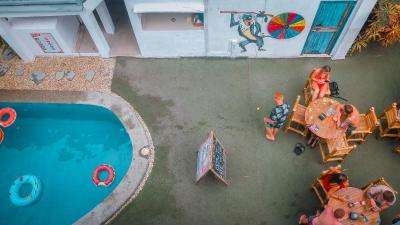 The actual hostel was well set up with the pool and bar etc. Private rooms were very clean and comfortable. Some of the best pillows I have ever used! Music was very good also. After I slept there there the first night I left because there was bugs and cockroach in my room. The sheets were dirty and the hotel is in a construction zone which should have been made clear. About 1km away from White beach but the road that leads there is not a road it is under construction and is basically a dirt and dust road. Will not be staying here again. Also the wifi does not work in the rooms and does barely work in the lobby. Good party atmosphere, with fun bar and restaurant. The name of the place is unique which draws mostly young people to the property. They have a party mostly everyday. 住过最让人恶心的青旅，没有之一。 I have been traveled more than 15 countries. Four times in boracay. 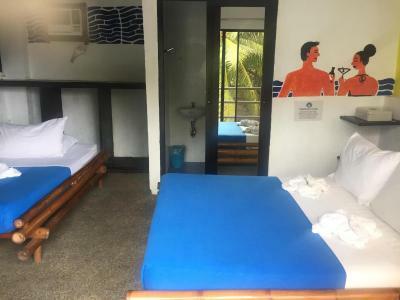 Mad monkey boracay is the most disgusting hostel ever. Had the best and craziest stay in Boracay. I was supposed to stay 3 nights and ended up staying a whole week. The staff is amazing and they make you feel like home every day. The food is really good and the drinks pretty cheap. 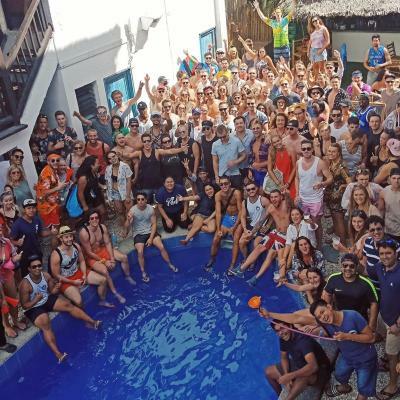 If you want to meet people from all over the world, make friends, and have the best time of your life, this is where you want to stay. Shout out to Brandon, Sam and Melissa, love you guys. Staff was helpful however we never saw the deposit from our towel. They did not understand that we switched from dorm to private room and therefore still had the towels with the deposit. But overall it was a good place to stay. I could say some power outlet is not maintained/not functional. The room could be also hot during the day. No complimentary toiletries and I want to highlight the absence of curtain to each bed. I find the bed curtain essential to a hostel for privacy purposes. The music blasts every night until 1am, so loud that you can actually feel the bed vibrating, hear every word of the song and voices of all the drunk guests. I would only suggest staying here if you enjoy getting blind drunk every night. Also the hostel is on a road that is having significant building and renovations work, the area around the hostel has large spikes, holes, machinery and is poorly lit. Beds were comfy, and large. Had a pool, and free WiFi in reception area. Bar food was average, staff were generally nice.